The fab readers at I Am a Reader, Not a Writer and BookLove101 have put together another one of their famous giveaway hops. On this blog, sign up for my ya paranormal Shadows Rising, part of the Midnight Guardian series. I’ll give away 3 signed paperback first editions. Hurry, drawing ends Feb. 4th. Just look for the Enter the Giveaway link below to enter via Rafflecopter. 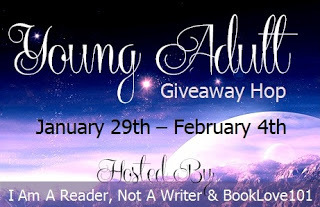 Below that you’ll find a list of the other 221 blogs participating in the Young Adult Giveaway Hop. Have fun and Good Luck! It’s really hard to pick just one favorite YA book. I love so many! But Shadow and Bone is definitely one of my tops. Probably my all time favorite is The Book Thief. Thanks for the giveaway! If I went old school I would pick Little Women. My current favorite is The Luxe series. I enjoyed The Friday Society this year! I hate having to pick favorites, haha. Hmmm, current favorite would be… Divergent. I’m going to go with “Beautiful Creatures.” I also enjoyed the “Perfect Chemistry” series. I enjoyed Pushing the Limits 🙂 but it is really hard to pick a favourite. Thanks for your giveaway! I don’t really have a favourite, but there are lots that I’ve enjoyed: Daughter of Smoke & Bone by Laini Taylor, Wither by Lauren DeStefano, Cinder by Marissa Meyer, and I’m listening to Divergent by Veronica Roth right now and loving it! My favorite YA books are Twilight Saga (all 4 books) and The Vampire Academy Series and Bloodlines Series. Thank you for a chance to win and for being a part of this fun and awesome blog hop!! i really liked the selection. I have so many!! My main faves are the Tiger’s Curse series!! Anything by Julie Kagawa is great! Thanks! My favorite YA that I have read recently is The Hunger Games series. Thanks for the great giveaway! My favorite YA is The Hunger Games. I love a lot of favorites, but I’ll only list two right now: the Iron Fey series by Julie Kagawa and the Modern Faerie Tale series by Holly Black. Previous Previous post: Indie Author Series: Kindle/Amazon – All In or Diversify? Next Next post: YA Indie Author Spotlight: Wahoo it’s me!